Speculation is showing no signs of slowing and auction sales are ever stronger, and prices ever higher. The price appreciation has been staggering for the generation of young Chinese artists and the number of investors continues to grow. It often takes only a few years for a Chinese artist to see a tenfold price increase, as with ZHANG Xiaogang or CAI Guoqiang to cite just a couple of examples. Symbolic of the price increases: the ten most successful auctions of contemporary Chinese art have been recorded over the past twelve months. In the end, in 2006, 31.3% of the Chinese contemporary artworks sold at auction achieved more than $100,000. Given such price levels, the proceeds on Chinese contemporary art sales increased by a factor of ten in 2006. Updated on 23 Apr 2019: RU Xiaofan (1954) is an artist born in 1954 The oldest auction result ever registered on the website for an artwork by this artist is a drawing-watercolor sold in 1989, at Drouot, and the most recent auction result is a drawing-watercolor sold in 2019. Artprice.com's price levels for this artist are based on 111 auction results. Especially: painting, print-multiple, sculpture-volume, drawing-watercolor, ceramic. 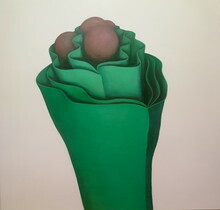 3 artwork(s) are currently for sale on Artprice's Marketplace , sold by 2 Artprice store(s).